^ a b "About Newfoundland and Labrador: Land Area". Government of Newfoundland and Labrador. Archived from the original on 2006-10-03. Retrieved 2018-01-30. 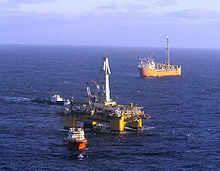 ^ "About Newfoundland and Labrador: Land Area". 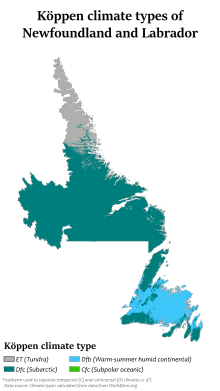 Province of Newfoundland and Labrador. Retrieved 2018-01-30. ^ Vigneras, L.-A. (1979) . "Corte-Real, Miguel". In Brown, George Williams. Dictionary of Canadian Biography. I (1000–1700) (online ed.). University of Toronto Press. ^ Dawson, Joanna. "The 1563 Basque Will". canadahistory.ca. Archived from the original on 1 March 2017. Retrieved 1 July 2018. ^ Barkham, Michael M. "The Oldest Original Civil Document Written in Canada: The Last Will of Basque Sailor Domingo de Luca a, Placentia, Newfoundland, 1563" (PDF). placentia.ca. Retrieved 1 July 2018. ^ Fraser, Allan M. (1979) . "Calvert, Sir George". In Brown, George Williams. Dictionary of Canadian Biography. I (1000–1700) (online ed.). University of Toronto Press. ^ Compare: Moir, John S. (1979) . "Kirke, Sir David". In Brown, George Williams. Dictionary of Canadian Biography. I (1000–1700) (online ed.). University of Toronto Press. ^ "Traditional Music". www.heritage.nf.ca. Retrieved 2019-01-12.